As you age, you may begin to notice that your teeth aren’t quite the same shade of white that they were in your youth. Typically, noticeable discoloration begins in the late 20s and early 30s. A variety of factors can speed up the discoloration process including chemical staining from drinking caffeine and smoking, a genetic predisposition to early yellowing, and the onset of gum and tooth disease. Cosmetic dentists have a very extensive choice of tooth whitening systems. The level of whiteness that can be achieved will depend on the level of discoloration of the teeth and how they came to be stained. Many people achieve a whiter, brighter smile with our simple whitening procedure. Its safe, quick and inexpensive. You can whiten only your upper or lower teeth, or your entire smile. You can gradually lift stains through a convenient at-home whitening process, using thin trays and gentle whitening gel. Or, if you prefer the dramatic effect of in-office bleaching (power-bleaching). This procedure can be done in as little as one to two visits or combined with home bleaching. What should I use to whiten my teeth? We have all seen the wide selection of tooth whitening kits located in every drug store across the country. Everyone wants to ask, do they really work? In most cases the answer is yes to some extent. However, there is no better option for those seeking tooth whitening than that offered by professional dentists. Trained, certified professionals have access to a wider range of tooth whitening techniques and materials than are available over the counter. We have developed an ideal tooth whitening procedure that guarantees you a healthier-looking, whiter smile. We combine the power of in-office tooth whitening techniques, with the comfort and convenience of home tooth whitening products. The entire process, from start to finish, takes about two weeks. However, you will only spend about four hours of that time in our office one two hour appointment at the beginning, and another at the end. In the interim, you will be at home using a tooth whitening kit provided by our dentists. The first in-office procedure produces immediate results in an immediately discernible whitening of your teeth. Every evening for the two weeks that follow, you will use a custom-fit tray that our dentists have uniquely designed for your two weeks. During that time, it is recommended that you refrain from the consumption of products that could interfere with the tooth whitening process. These include coffee, tea, cigarettes, or wine. You will notice your teeth becoming whiter by shades over this time period. In your final office visit, you will receive another professional tooth whitening treatment. The optimal whiteness of your teeth will then be attained. Our dentists will then be able to apply a special coating that will seal the results of your tooth whitening procedure. You may then resume consumption of the tooth-staining products, if you wish. While these products will still stain your teeth eventually, our tooth whitening procedure will protect against this for some time. Down the road, you may consider having additional tooth whitening procedures to counter this effect. 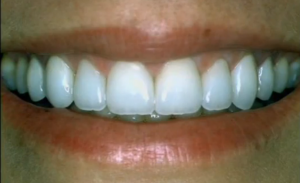 The success of our teeth whitening technique largely depends upon the cooperation and determination of the patient. Those who follow our instructions carefully tend to be extremely satisfied with the results. They walk away with a whiter smile than they have had in years. It is important to note, however, that tooth bleaching will not change the color of certain fillings. If you have fillings that you would like crowned or replaced, be sure to discuss that with our doctors. Numerous options may be available to deal with this issue. The tooth whitening techniques used by Dr. Joseph Hyde have been given the full stamp of approval by the American Dental Association. This procedure is perfectly safe, and will have no negative effects whatsoever on the health of your teeth and gums. If you want the restored sense of confidence that a whiter smile can bring, and are looking for a dentist in the Buffalo area, give us a call at (716) 823-2898 today. We would be happy to schedule an appointment, and discuss our tooth whitening procedure with you.